Frank Aschenbrenner started his college football career at Marquette, but World War II got in the way of his education, though not football so much. Aschenbrenner was in the Navy Air Corps and it was common for the Navy to send personel to various colleges for training before shipping out. While doing such training at North Carolina in 1944, Aschenbrenner also played some football there. In 1945, Aschenbrenner played for the service team at the Great Lakes Naval Training Center (GLNTC) under Paul Brown who also coached the Cleveland Browns. 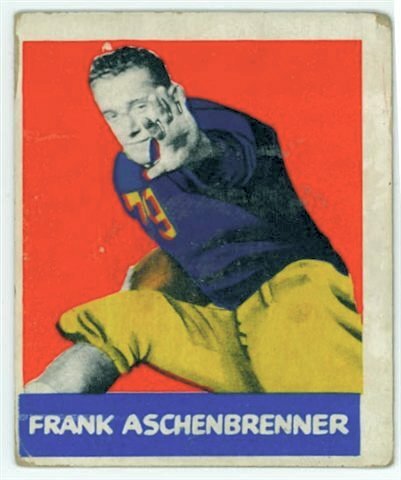 After the war, Aschenbrenner was drafted in the sixth round of the 1947 NFL college draft by the Pittsburgh Steelers and also in the first round of the AAFC (All-American Football Conference) draft in 1947 by the Buffalo Bills. Aschenbrenner, however, returned to college to finish his education at Northwestern and never played for the Steelers or Bills. In fact, he was traded by both teams with the Steelers sending him to the Los Angelas Rams and the Bills to Cleveland and his old military coach Paul Brown. While this was going on, Aschenbrenner became a star at Northwestern and played in the 1949 Rose Bowl, where he was named the outstanding player in the game. Aschenbrenner ran for 119 yards, included a 73 yard dash for a touchdown to open the scoring. Aschenbrenner's rights in the AAFC had been traded by Cleveland to the Chicago Hornets. Aschenbrenner played six games for Chicao in the AAFC in 1949, but they tried to convert him to defense where he had never played before and he was released. Aschenbrenner then spent another two years in the Navy Air Corps before a brief four game stint with Montreal in 1951. Frank Aschenbrenner passed away on January 30, 2012. No other individual statistics are available for that year in the East. The games played number is unofficial and taken from the 2005 Montreal Media Guide.